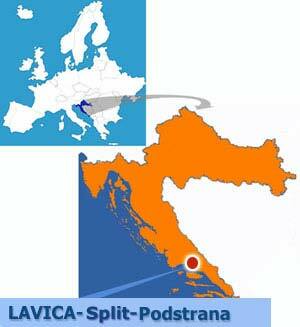 A 'Lavica' Tourist Village is situated on the sea shore in a small town of Podstrana, nearby town of Split. Podstrana is placed along the area between rivers 'rnovnica and Mutogras hill, so its coast is 6 km long. There are mostly sand and pebble beaches surrounded by a lush mediterranian vegetation and pine trees. Small comfortable houses are there to give you extraordinary relaxation.Town of Gornja Podstrana is situated underneath the Perun hill, with extraordinary clear air and unforgettable view on the islands: Brač, Hvar, Šolta, Korčula and Vis, with infinite sea blueness under your feet.